At the heels of the Gregorian New Year is the Chinese New Year. The Chinese traditionally follow the lunar calendar rather than the solar Gregorian calendar. This year’s Chinese New Year falls on the 23rd of January. It will be the 4,710th new year based on the Chinese calendar although some references point out that it is actually the 4,709th year. For many, it is more important to find out what animal is associated to the year 2012 according to Chinese astrology. The Chinese calendar is on a 60 year cycle. Each year is represented by a combination of one of the 12 animals in the Chinese zodiac (known as Shēngxiào) and one of the 5 elements. The 12 animals under the Chinese zodiac, in order of their appearance, are: "rat, ox, tiger, rabbit, dragon, snake, horse, sheep, monkey, rooster, dog, and pig. The 5 elements are metal, water, wood, fire and earth." 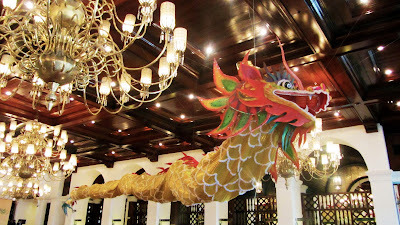 This year, 2012, is represented by the dragon, which is the 5th sign of the Chinese zodiac, and by the water element. Chinese astrologers base their reading of a person's traits and his future on his animal sign and the element associated with his year of birth. Each animal has personality traits associated with it and when combined with the characteristics of a particular element, these traits are either enhanced or softened. Yin and Yang, an ancient Chinese concept, also has an effect on a person's horoscope. The odd years on the Chinese calendar are designated as Yin years while the Yang years are even numbered years. Yin is earth, female, passive and dark. Yang is heaven male, active and light. Were you born a dragon? In determining a person's animal according to Chinese astrology, one must never rely simply on the year of his birth. Not everyone born on 1940, 1952, 1964, 1976, or on the other years referred to as a dragon year can actually call the dragon their animal sign. The animal signs are, as stated earlier, determined by Chinese astrology rather than the Gregorian calendar years. Chinese astrology is more complicated compared to western astrology. Chinese New Year is determined by the appearance of the second new moon right after the winter solstice. This may fall sometime after January 20 and before February 21 on the Gregorian calendar. The Chinese use the lunar system to determine the start of each year. However, the beginning of each month is based on a solar system rather than a lunar system. The first month of the year is always the Tiger month which is the start of spring and often falls around the 4th or the 5th of February each year. On the Chinese astrology calendar, the official start of the year of the Yang Water Dragon is on February 4, specifically at 18:23 (according to China's time zone). Technically, following this train of thought, anyone born on or after January 23, 2012 but before February 4 18:23 is classified as a rabbit. This need to be precise in determining one's animal sign is probably the reason why many people prefer to simply take the Gregorian year assigned to the animal sign as the basis for their personal animal sign. Do you have the traits of a dragon? To determine a person's real temperament and personality plus his future according to Chinese Astrology, it is essential to provide information on a person's date of birth as well as his time of birth. These two essential pieces of information are combined by Chinese fortune tellers with the animal sign, the ruling element, Yin or Yang, the sun and moon positions and the directions (north, south, east, west and its combinations) to determine and describe a person's personal characteristics and in predicting his possible future. The dragon is the mightiest of all the animals of the Chinese zodiac. It is a well respected symbol in China appearing in palaces as well as modest homes. Dragons often appear on imperial clothing. The dragon stands for power and might, success and good fortune, and for happiness. Respected and revered in Chinese culture, the dragon of the east is far different from the feared-fire breathing dragon of the west. People born under the year of the dragon are said to be stately, loyal, confident, strong, decisive, perfectionists, proud, confident, self-assured, dignified, noble, intellectual, energetic, fiery, passionate, vigorous, generous, magnanimous, and artistic. Sometimes they can be demanding only because they have very high standards. Dragons appear to be brash, tyrannical, conceited, arrogant, tactless, intolerant, and imperious. The dragon is said to compatible with the following animals: rat, snake, monkey and rooster. It is least compatible with a fellow dragon, ox, rabbit, and dog. In the case of the water dragon, the water element is said to counter the fiery nature of the mighty beast. Water provides the much needed cooling power that results in level headedness for dragons that need to make important decisions. Patience that comes from the water element will help temper the passionate dragon. The water dragon is intelligent and uses his innate wisdom in all aspects of his life. The dragon often aspires for greatness and succeeds in life through sheer determination and perseverance. Water will help prevent burn-out caused by too overworking himself just to succeed. Because dragons tend to be impulsive and stubborn at times, the water element will make those born in the year of the water dragon more open to collaborating with other rather than overly asserting themselves. When asked who the famous personalities born under the dragon sign are, Bruce Lee's name often comes up. However, Lee, the quintessential martial artist and the man behind the film Enter the Dragon, is not a water dragon but a metal dragon. Some of the water dragons you may know are Russian Prime Minister Vladimir Putin, Singaporean Prime Minister Lee Hsien Loong (son of Lee Kwan Yew), U.S. General David Petreaus, tennis legend Jimmy Connors, authors Amy Tan, Pearl S. Buck and Anna Quindlen, actors Jeff Goldblum, Isabella Rossellini, David Hasselhoff, Liam Neeson, and Mr. T, singer/songwriter George Strait, director Robert Zemeckis, and film producer Harvey Weinstein. It is quite exciting to find out what your Chinese zodiac sign is and consequently, what future awaits you based on your animal sign. However, your zodiac sign should not be the basis of how you see your life and how you live your life. You should always live your life to the fullest without causing hurt, sadness or despair on others. Be compassionate, humble and charitable. Good things come to good people. Whether you are a dragon, a monkey, an ox, a Gemini, a Virgo or a Libra, all you need to do is to do unto others what you want others to do unto you. I am not Chinese but I celebrated Chinese New Year with some of my Asian fiends. I like this tradition. We went to a place where food and beautiful decorations are everywhere. It was really an amazing experience. I look forward to celebrating the next Chinese New Year in 2013. A lot of countries with Chinese communities are celebrating this once a year celebration, the Chinese New Year. It is also one of the events that most Asian look forward to. I was able to visit China last year, and I can say that it's very enticing place. Interesting insight about the yang water dragon. Hope all is true about this year for the water dragon-born people. I love celebrating Chinese New Year with my Chinese friends in the Philippines. They really have the most extravagant feast during this holiday. And their culture is really deep and strong. I always check some flights to Manila so I won't miss the fun there.